The women of Gettysburg endured quite a few hardships during the summer of 1863 and for quite a few months following. With the men off to war, the women of Gettysburg pulled themselves up by the bootstraps and began putting their town back together. It is during the month of March we recognize the contributions of women to society and history, and without the women in Gettysburg, who knows what would have become of the town. Take this quiz to test your knowledge of women in Adams County throughout history. Good luck and don’t forget to share your results with your friends! We’re glad you enjoyed it, Rick! 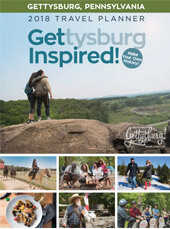 There is always new history to learn in Gettysburg! Thanks for these quizzes. I enjoy them. I especially like reading all the possibilities of answers. Funny! Another cause supported by Mamie Eisenhower is the Eisenhower Society. Mamie supported the Society when Henry Scharf (good friend of Ike’s and Gettysburg Hotel owner) and attorney Charlie Wolf suggested they start a group in 1969. She attended every statue ceremony at the College to celebrate Ike’s birthday. Her quote is printed on all of the Society’s stationery and brochures: “I hope and pray that the Society will become a perpetual living memorial to Ike.” December 14, 1975. Thank you for that additional piece of women’s history! Mamie was a supporter of many causes and programs. I got 3 out of 5. Not bad. Good to know the other answers. Great job! We’re glad you enjoyed the quiz. You’re welcome! We’re glad you enjoyed it.